Visit our interactive guide to learn more. Read the Wells Fargo Secured Visa® Card Agreement. Pay more than the minimum each month. When you pay less than the balance, your balance accrues interest. That means you have to pay more to spread your payments out over time. The secured card requires a security deposit that must be pledged when you apply. If your application is approved, the security deposit may be transferred to a collateral account immediately. Your security deposit is equal to your credit limit. If you deposit $300, your credit line (the maximum amount you can spend) is $300. Your security deposit funds will be held in a separate, non-interest bearing collateral account that you will not have access to. If your account is upgraded your security deposit will be refunded to you. Wells Fargo can apply the security deposit as payment for any unpaid balance or fees if your account is closed for any reason. As with all credit cards, you must make the monthly minimum balance to remain in good standing. If you wish to increase your credit line, you may add to your security deposit. Credit line increases must be funded by the cardholder, and are subject to terms and eligibility rules. With responsible credit card use, you may become eligible for an upgrade to an unsecured Wells Fargo credit card. There is no pre-set time frame for upgrade and not all accounts will qualify. Upgrades are subject to credit qualification and are restricted to U.S. citizens and permanent resident aliens with a valid Social Security Number or Individual Taxpayer Identification Number. Accounts are reviewed for a number of factors, including how you manage this account and your other financial relationships. Review the Visa Guide to Benefits (PDF) to learn more. Mobile payment options to make convenient on-the-go purchases with your Wells Fargo card in Google PayTM, Apple PayTM, and Samsung Pay. If you applied online, you will receive the status of your application on the confirmation page and we will send you a confirmation email. If we need more time to review your application, you will receive an application ID and a phone number that you can call to check your application status. Upon approval of your application, we’ll transfer the funds you provide into the collateral account. This can take approximately 7 – 10 days, and these funds need to be available in your account to process the transfer and open your credit card account. You will receive your Secured Credit Card by U.S. Mail, 7-10 days after account opening. How does a secured credit card differ from unsecured credit cards, and how is it the same? Unlike unsecured credit cards, a secured credit card requires a minimum $300 security deposit from you to secure your credit line. Does the secured credit card look different from an unsecured Platinum Visa® Credit Card? 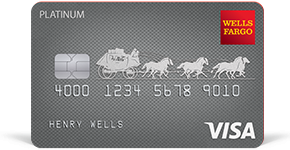 No, the Wells Fargo Secured Credit Card design looks exactly like the Wells Fargo Platinum Visa® Credit Card, and it can be used for purchases and payments just like any other credit card. The security deposit in your collateral account is held to secure your credit line. Funds cannot be withdrawn from the security deposit or applied as payment for balances or fees. Funds in the collateral account do not earn interest. By borrowing against and then paying off your credit line, you can establish a history of on-time payments. This can help establish you as a responsible borrower. Do I still need to make monthly payments, even if I already provided a Security Deposit? Yes, you must make the payment on time each month and pay the required minimum payment. You may also pay another amount above the minimum or pay the balance in full each period. You must keep the balance within the established credit limit. By paying at least the required minimum payment before the due date and staying within your credit limit, you show the bank and the credit bureaus that you can manage credit responsibly. Funds cannot be withdrawn from the security deposit or applied as payment for balances or fees. Can I become eligible for the unsecured Platinum Visa® Credit Card? Cardholders can become eligible for an upgrade. Whether an upgrade is granted depends on a number of factors including how you manage this account and all of your other financial obligations. There is no pre-set time frame for upgrade and not all accounts will qualify. Wells Fargo reviews Secured Credit Card accounts for upgrade eligibility periodically. In the review, your overall performance across financial products will be considered, including your credit history and your Wells Fargo Secured Credit Card account performance. Only U.S. citizens and permanent residents can qualify for upgrades to an unsecured credit card. Up to 5% for each balance transfer, with a minimum of $5. Unless an introductory or promotional APR is in effect, we will add a “Margin” to the U.S. Prime Rate to determine your standard variable APR. For each billing period we will use the U.S. Prime Rate, or the average of the U.S. Prime Rates if there is more than one, published in the Money Rates column of The Wall Street Journal three business days prior to your billing statement closing date. If the U.S. Prime Rate is not published or is otherwise unavailable, whether temporarily or permanently, we will select a substitute index that we believe, in our sole discretion, to be similar to the U.S. Prime Rate. The U.S. Prime Rate is 5.50 percentage points as of 04/19/2019. The "Margin" for purchases and balance transfers will be 15.74 percentage points. The annual fee for this account is $25. The annual fee will be charged on your first periodic statement and on your Secured Credit Card account opening anniversary each year. The annual fee will not be billed after your Secured Credit Card account is closed. If your Secured Credit Card account is closed within 90 days of the annual fee being charged, the annual fee will be refunded. This is an application for a secured credit card account. In consideration of the issuance of this secured credit card account, you have authorized Wells Fargo Bank, N.A. to open a deposit account with your security deposit called the "Secured Card Collateral Account" (the "Collateral Account") in your name. To secure all of your obligations arising under this credit card account, you assign, transfer, pledge, grant a security interest in, and set over to the bank all rights, title, and interest in the Collateral Account/Security Deposit and in all renewals, additions and proceeds of the Collateral Account, You agree that this security interest, pledge, and assignment includes and gives the Bank the right to redeem, collect and withdraw any part or the full amount of the Collateral Account upon any default under the Agreement or in the event your secured credit card account is terminated for any reason. You acknowledge and agree that this security interest, pledge, and assignment means that the bank has exclusive control over the Collateral Account, You may not make any withdrawals from the Collateral Account while it secures your credit card. The Secured Card Collateral Account is a non-interest bearing account, therefore no interest will be paid to you on the Collateral Account. This security interest, pledge, and assignment is given as security for any and all amounts you may owe, including but not limited to interest, fees and charges which may accrue under your secured credit card account. You agree that if the secured credit card account is closed for any reason, the bank may apply funds in the Collateral Account to pay off any balance on the credit card account. If there are still funds remaining in the Collateral Account after doing so, these funds may remain on deposit for up to 60 days before being remitted to you by electronic transfer to the Wells Fargo checking or savings account that was used to fund the original deposit. If the account is no longer open, or the collateral account was funded using cash or a check, you will receive a check for any remaining funds for the collateral deposit in the mail. If you are no longer on the account that you used to fund the original security deposit, you must notify Wells Fargo of this before or at the time of closure to prevent electronic transfer of the security deposit to the funding account. The Collateral Account and Bank's practices are subject to the terms of the Collateral Account, to Federal and State laws and regulations, and to Bank policies. To pay all charges and follow all practices set forth in the terms applicable to the Collateral Account. To hereby stipulate to the terms of the arbitration program described in the Agreement. To abide by all future changes to the terms and charges for the Collateral Account. The Bank may disclose information about the Collateral Account and the credit card account to credit reporting agencies and to other persons or agencies who, in its judgment, have legitimate business purpose for obtaining such information, subject to applicable law. This application is for a credit card with Wells Fargo Bank, N.A. You certify that all information provided is true, correct, and complete and that you have the legal capacity to enter into this contract. The Bank is authorized to verify or check any of the information given, to obtain credit reports on you and to make Overdraft Protection advances if you requested that feature. You authorize the Bank to obtain information from others to investigate your credit, employment and income history and state records including state employment security agency records and to report information regarding your account to consumer reporting agencies. You agree that the Bank will determine the amount of credit extended, as well as which product you qualify for, based on the Bank's review criteria. If you do not qualify for the product or pricing requested or for the lowest pricing offered, you authorize the Bank to grant you the product and pricing for which you do qualify. You agree to be bound by the terms and conditions of the Agreement, which will be sent to you, and understand that the terms of your account may be changed at any time, subject to applicable law. You hereby stipulate to the terms of the arbitration program described in the Agreement. You understand and agree that you will be liable for payment of all amounts owing on the account. Not all accounts will qualify for upgrade to an unsecured credit card. For accounts that qualify for upgrade, upgrade timing will vary. Eligibility to upgrade to an unsecured credit card is restricted to U.S. citizens and permanent resident aliens with a valid Social Security Number or Individual Taxpayer Identification Number. Periodically throughout the year the Bank will review your account to determine qualification for a possible upgrade to an unsecured credit card. The Bank will consider many factors including but not limited to how the Secured Credit Card account, other accounts and other Wellsf Fargo accounts are managed. In the following Terms Applicable to Secured Card Collateral Account ("this Collateral Account Agreement"), "you" and "your" refer to the owner of a Secured Card Collateral Account (the "Collateral Account"). The "Bank," "we" or "us" refers to Wells Fargo Bank, N.A. Together, you agree that this Collateral Account Agreement and the Secured Agreement form a binding contract and make up the entire agreement between you and the Bank regarding the handling of your Collateral Account. This Collateral Account Agreement applies to each deposit account at the Bank, as well as all substitutions and replacements thereof, that has been assigned or pledged by you as collateral for the credit card account(s) issued to you by the Bank. You should retain a copy of this Collateral Account Agreement and any information that the Bank provides you regarding changes to this Collateral Account Agreement for as long as your Collateral Account is open. You should ask the Bank any questions you have about this Collateral Account Agreement. This Collateral Account Agreement may be changed by the Bank from time to time. Notice of a change may be provided by any means the Bank considers appropriate. Unless the law requires notice by another means, notice of a change in this Collateral Account Agreement may be provided by posting in the Bank's lobby. If any part of this Collateral Account Agreement is held invalid in a legal proceeding, it will not affect the validity of any other part. The Bank may assign the Collateral Account at any time and without providing prior notices to you of the assignment. You agree that the Bank may transfer your security deposit from the account specified by you upon approval of your application. If you do not have the amount specified for the security deposit in your account, but you do have at least $300 in your funding account, you agree that the Bank can immediately transfer $300 to your collateral account. If your account is approved, but not funded immediately, you will have 30 days to complete funding after which time your account will be closed. If your application is approved, your credit limit will be equal to your security deposit and the security deposit will be held in a Wells Fargo Collateral Account opened in your name. Acts and omissions of other financial institutions. The Bank will not be liable for the intentional wrongdoing or the lack of ordinary care by any financial institution to which the Bank has forwarded a check, draft, or other order or instruction for the payment, transfer or withdrawal of funds (an "Item") for deposit to your Collateral Account. Waiver. If the Bank waives any of its rights on any one occasion, it will not be considered a waiver of the Bank's rights on any other occasion. Verification of transactions; rights to reverse erroneous credits. All transactions, including without limitation those for which the Bank has provided a receipt, are subject to the Bank's final verification. The Bank may reverse any credit it has erroneously made to your Collateral Account at any time without prior notice. General limitations. The Bank will have no liability to you, other than as provided in this Collateral Account Agreement. The Bank will meet its duty to care for your Collateral Account if it exercises ordinary care in the transaction at issue. When the Bank takes an item for processing by automated means, "ordinary care" does not require that the Bank examine the item. "Ordinary care" requires only that the Bank follow standards that do not vary unreasonably from the general standards followed by similarly situated banks. A mere clerical error, or an honest mistake, will not be considered a failure of the Bank to perform any of its obligations. Unless imposed by law, the Bank will not be liable for consequential, special, punitive or indirect loss or damages. The Bank is authorized to supply your endorsement to any Item taken for collection, payment or deposit to your Collateral Account. This Collateral Account serves as the collateral for the credit card account(s) issued to you by the Bank. It may not be used to secure any other loans. The Bank has the right to require 7 days written notice before you withdraw or transfer money from this Collateral Account. Notwithstanding the foregoing sentence, you agree that you may not withdraw funds or exercise any other rights over this Collateral Account until your obligations under the Agreement have been fully paid and the credit card account has been closed. Mailing of statements. Statements and other information regarding your Collateral Account will be mailed to you at the last address you have given the Bank, unless the Bank agrees otherwise in writing. If your Collateral Account is a joint account, the Bank may mail the statement to any owner. Your obligation to review statements and items and to report irregularities. You agree to promptly and carefully examine each statement you receive from the Bank. You will promptly report any erroneous credit. Within 30 days after the Bank mails or otherwise makes the statement available to you, you will report to the Bank any claim for credit or refund due for example (and without limitation) to either an erroneous debit, a missing signature, an unauthorized signature, or a material alteration. If you don't, the stated balance will be conclusively presumed to be correct. This means that the Bank is released from all liability for the Items charged to your Collateral Account, and for all other transactions or matters covered by the statement. You will pay the Bank a fee for its services in accordance with its then current fee and information schedule. Account-related services obtained through an affiliate bank are subject to the fees disclosed in its then current fee and information schedule. Fees and expenses described in this section may be deducted from your Collateral Account and may, at the Bank's option, be charged against your Collateral Account during a statement period other than the one to which they relate. If your Collateral Account is closed, you will continue to be responsible for any fees that may have accrued, any Items deposited to your Collateral Account prior to its being closed, and any fees and expenses related to those Items. If the Bank incurs any costs or expenses enforcing this Collateral Account Agreement, you will pay those costs and expenses, including reasonable attorneys' fees and court costs. If in connection with a direct deposit plan funds are deposited to your Collateral Account and later returned to the originator, the Bank may deduct the amount from that or any other account you have, without prior notice and at any time, except as prohibited by law. The Bank may also use any other legal remedy to recover the amount. The Bank may convert your Collateral Account to another product offered by the Bank at any time by giving you prior notice. If you do not close your Collateral Account it may convert to that other product on the date specified in the notice. If more than one of you open a Collateral Account it will be presumed to be a joint account with right of survivorship unless state law creates a contrary presumption or the Bank otherwise agrees with you in writing. Any sums in a joint account may be paid, on request, to any owner without regard to whether any other owner is then incapacitated or deceased or whether the account includes a right of survivorship. If your Collateral Account does include a right of survivorship and one of you dies, the Collateral Account is payable to any survivor, subject to the Bank’s right of setoff and security interest. If your Collateral Account does not include a right of survivorship and one of you dies, the Collateral Account may, subject to the Bank’s right of setoff and security interest, be paid to any survivor or to the personal representative, heirs or successors of the deceased owner even though not the last surviving owner. The Bank has no obligation to separately account for each of your interests in the Collateral Account. An owner may supply an endorsement of another owner. The Bank may act on the instructions of any owner; however, instructions to remove an owner’s name or restrict an owner’s use may only be made by the owner whose name is to be removed or whose use is to be restricted, by that owner’s legal representative(s) or by court order. Subject to the terms of this Collateral Account Agreement, the Bank may close the Collateral Account on the instructions of any one of you or your legal representative(s). You may not pledge, assign or in any other manner transfer all or a part of or any interest in your Collateral Account. The Bank does not have to recognize the transfer, has no duty to make further inquiry and may make its acceptance conditional. The Bank has the right to charge back to your Collateral Account any Item deposited to your Collateral Account that is returned. The Bank has the right to pursue collection of such Items, even to the extent of allowing the payor bank to hold an Item beyond the midnight deadline in an attempt to recover payment. These collection efforts may include sending such Items back for collection one or more times. The Bank will have no liability for resubmitting or not resubmitting these Items (or for taking any other action it considers reasonable to recover payment) without notice to you. No interest will be paid to you on this collateral account. Minimum deposit requirements. In order to open this Collateral Account, a minimum security deposit of $300.00 is required as security for a credit card account. Primary collateral account owner. The primary account owner of this Collateral Account must be the same person who is the primary holder of the credit card account that is secured by the funds in this Collateral Account. Any notice you send the Bank will not be effective until it is actually received and the Bank has a reasonable opportunity to act on it. Any notices, statements, or other correspondence the Bank sends you may be sent by ordinary mail to the last address the Bank has for you in its records. If there is more than one owner or person authorized to transact business on your Collateral Account, notices, statements and correspondence may be sent to any one of you. You assume the risk of loss in the mail. Any notice the Bank sends you will be effective when mailed. The Bank may impose minimum balance requirements or other limitations or restrictions on your Collateral Account and security deposit, provided such requirements are disclosed to you. Your Collateral Account and security deposit may be subject to legal action, such as a tax levy, third party garnishment, or levy, seizure or forfeiture. Such legal action is subject to the Bank's security interest and right of setoff. Fees or expenses the Bank incurs in responding to legal action (including without limitation attorneys' fees and the Bank's internal expenses) may be charged against your Collateral Account. The Bank may, in its discretion, close your Collateral Account at any time. If it does, it may send the balance by ordinary mail to the last address the Bank has for you in its records. Payment may be in cash, by cashier's check or bank draft. Before closing your Collateral Account, it will give you any notice required by law. You may not close the Collateral Account until your obligations under the Agreement have been fully paid and the credit card account is closed. We may use the security deposit funds in this Collateral Account to pay any balances on your credit card account. You agree that if the credit card account issued to you by the Bank is closed for any reason, the Bank may apply the funds in this Collateral Account to pay off any balance on the credit card account. We may hold funds in this Collateral Account for a minimum holding period of sixty days after the credit card balance is paid in full and the credit card account is closed in order to cover transactions that may be posted to the credit card account after it is closed. If the Bank receives a claim to all or a portion of your Collateral Account that is adverse to your interest and the Bank does not believe that it is otherwise adequately protected if it ignores that claim, the Bank may place a hold on funds that are subject to the claim. The hold may be placed for any period of time the Bank believes to be reasonably necessary to allow a legal proceeding to determine the merits of the claim to be instituted. The Bank's business days are Monday through Friday. Holidays observed by the Bank are not included. The Bank's business hours are listed in its then current fee and information schedule or location guide which is available upon request. if you give your permission. Available to citizens, permanent resident aliens, and nonresident aliens of the U.S. Your Secured Credit Card deposit will be refunded to you within 30 days of the upgrade and will be transferred electronically to the Wells Fargo checking or savings account that was used to fund the original deposit. If the account is no longer open, or the collateral account was funded using cash or a check, you will be mailed a check for the collateral deposit. If your Secured Credit Card account is closed, the security deposit will first be applied to any balance owed on the account and any remaining funds will be refunded to you within 60 days by electronic transfer to the Wells Fargo checking or savings account that was used to fund the original deposit. If the account is no longer open, or the collateral account was funded using cash or a check, you will receive a check for any remaining funds for the collateral deposit in the mail.